You only need 5 healthy ingredients to make an amazing almond butter fudge. And it only takes 5 minutes! 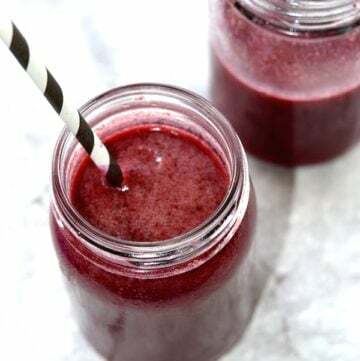 This recipe is great, it is sweet, it is easy to make, and it uses clean ingredients. What can be better than this? Enjoy a healthy treat without feeling guilty. Now that Summer is over, I am getting in the mood for more and more chocolate. Chocolate is my favorite ingredient in the fall and winter. 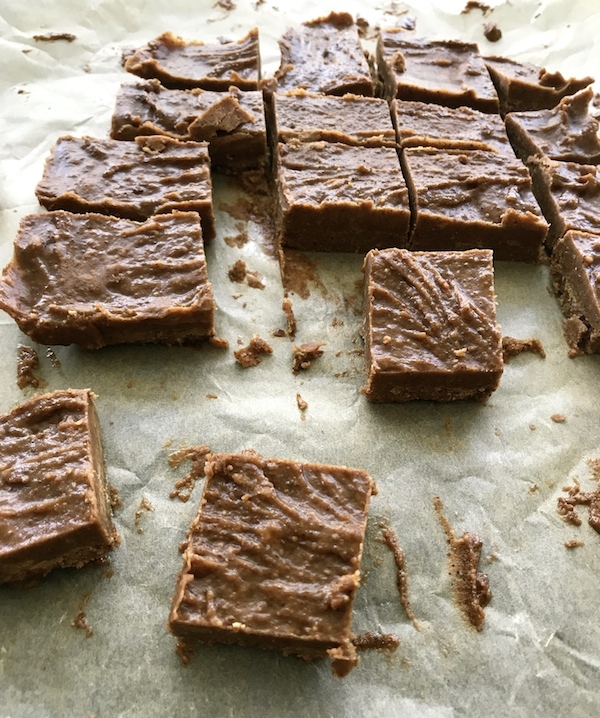 I personally like dark chocolate recipes, and this almond butter fudge made with cacao powder was just what I was looking for. Just perfect! I love almond butter. So after this recipe, I found out that almond butter + chocolate = pure happiness. My family is also in love with this almond butter fudge. It is really the perfect way to give your kids a healthy chocolate treat. Think about it. It is made with maple syrup (no refined sugars), coconut oil, organic cacao powder , plain almond butter, and a pinch of Himalayan sea salt. Wonderful! 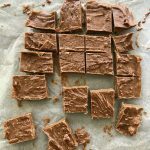 A pan of homemade almond butter fudge is also a great recipe you can make together with your children. Seriously, it really couldn’t be easier to make. The hardest part is trying not to devour the entire pan in a few seconds! Almond Butter Fudge For The Win! If you follow my blog, you know that I love cooking with healthy ingredients and my recipes are very easy to make. I am not a chef or have many years of experience in the kitchen. I like simple recipes made with high quality and nutritious ingredients. I believe in homemade food and easy to make recipes. 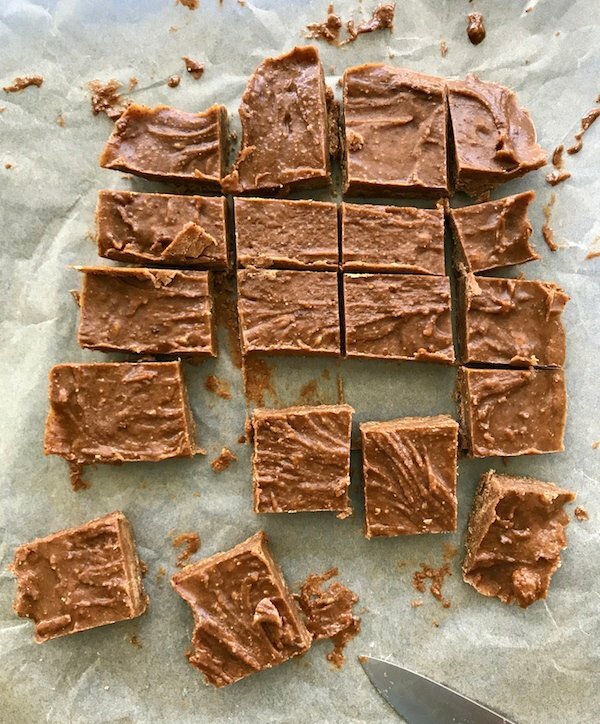 This almond butter fudge is a great example that you only need a few ingredients to make something totally delicious. I highly recommend trying it. These little squares of almond butter fudge will make you happy guarranteed. If you are interested in other easy and healthy recipes using almond butter, you can see my Easy 3 Ingredient Soft Almond Butter Cookies. A delicious and easy 5 ingredient almond butter fudge recipe for the entire family to enjoy. A gluten free treat made without refined sugars. In a medium size bowl, mix all the ingredients well with a hand blender. Place the mixture on top of parchment paper in a medium size square pan. Remove from pan and cut in small squares. I got about 16 squares. If you are interested in reading more about my blog, please take a look at my latest articles. 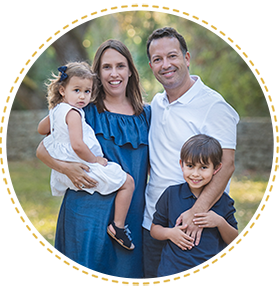 I am a mom blogger who loves to share creative and healthy fun food ideas. I also share DIYs, cooking hacks, and lots of family tips for a healthy lifestyle. I also believe kids deserve to eat real food. If you are interested, please check out my recipes for easy to make, healthy, and homemade family meals. You will find simple recipes made with good quality ingredients. Sounds Delicious! I can’t wait to try this recipe with my kiddos. I totally agree that the problem will be me eating it all. Maybe I’ll try it out in a smaller portion so I don’t lose control. haha. Love it! 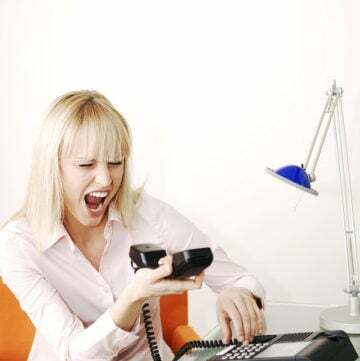 Could you use carob instead do you think? I have acid reflux and can’t use chocolate. Glad to know you liked the recipes. Wouldn’t organic dutched process cocoa give a better chocolate punch since this is not a baked product? Still new to all of this and trying to use all of my previous culinary/ pastry knowledge. 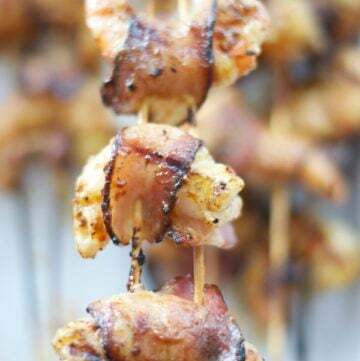 Love the simplicity of the recipe. Thanks in advance! Could you tell me how much stevia powder packets could be used instead of maple syrup for diabetics? Hello, I really don’t know exactly the amount but I searched for the amount of sugar in 1 packet of stevia powder and it equals 1 tbsp sugar. Remember not all packets are the same. I will try 1 packet for each tablespoon and add a little more if necessary. Hope this helps!